The park is about 20 miles north of Santa Cruz on Hwy 1. Año Nuevo State Park's rich variety of natural and cultural resources draws visitors from around the world. The park’s Natural Preserve offers an extraordinary wilderness experience, where every year up to 10,000 elephant seals return to breed, give birth, and molt their skin amongst the scenic dunes and beaches. The park features the Marine Education Center boasting a natural history exhibit, bookstore, and theater. This complex is housed in the historic nineteenth century dairy ranch of the Dickerman/Steele family. These restored buildings recall the early American settlers, while the midden sites throughout the Natural Preserve tell us the story of the Quiroste Indians that lived peacefully here for thousands of years prior to the 1600s. Cove Beach is a short walk from here for beachgoers and surfers. The physical terrain of Año Nuevo is distinctive, with coastal terrace prairie, wetland marshes, dune fields and coastal scrub hosting a high diversity of plants and animals, including the rare and endangered San Francisco Garter Snake and California Red-legged Frog. A hike out along ocean bluffs brings visitors to Año Nuevo Point, a major bird migratory route and fantastic birding location. Located just offshore sits Año Nuevo Island and the remains of a 19th century lighthouse and fog signal station. Built in 1872, the historic keeper's house now provides a new home to Brandt’s and Pelagic Cormorants as well as California Sea Lions. Otters and harbor seals are often sighted in the waters and magnificent Steller Sea Lions take up residence on the outlaying rocks. 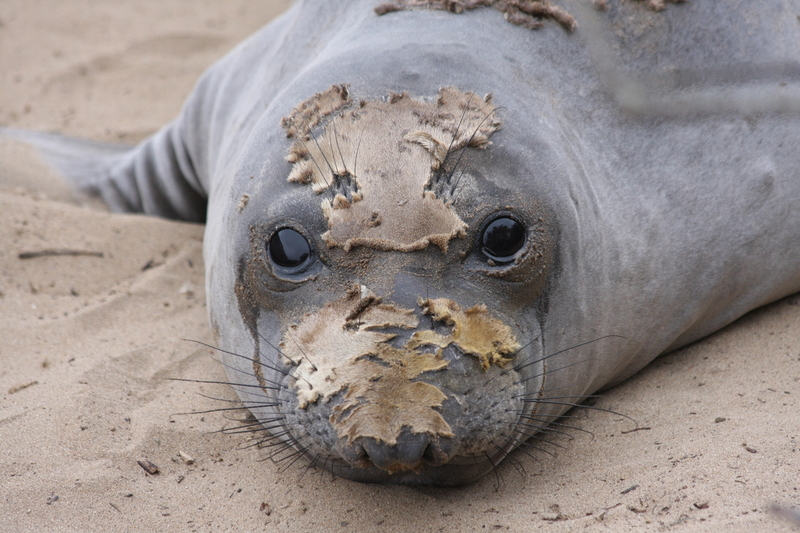 Click here to learn about visiting the northern elephant seals at Año Nuevo State Park. One of the largest mainland breeding colonies in the world for the northern elephant seal is at Año Nuevo State Park. A Natural Preserve has been established to protect the elephant seals along with many other animals such as otters, California sea lions, coyotes, cormorants, terns and more. Native plants and an untouched intertidal ecosystem also find shelter inside the Natural Preserve. Elephant seals can be observed here year round either on a docent lead tour or through a self guided permit system within the Wildlife Viewing Area. Northern elephant seals come ashore during the spring and summer months to shed their outer layer of skin and fur. This “molting” process takes from four to six weeks per animal as they rest along the beaches. Female and juvenile seals molt from May through June and older males from July through August. During the “Molting Season,” the Natural Preserve is open for self-guided hiking by Visitor Permit only. Obtain your free Visitor Permit daily from the entrance station, between 8:30 am and 3:30 p.m. No reservations are required. Visitors must exit the Natural Preserve by 5 p.m., which is earlier than the general parks closing hour of sunset. Please plan to arrive early enough to obtain a permit. These popular three-to-four mile hikes are considered moderate with varied terrain inlcuding sand dunes. Most groups require about two and a half to three hours to make the round-trip hike. The viewing areas close at 5pm. 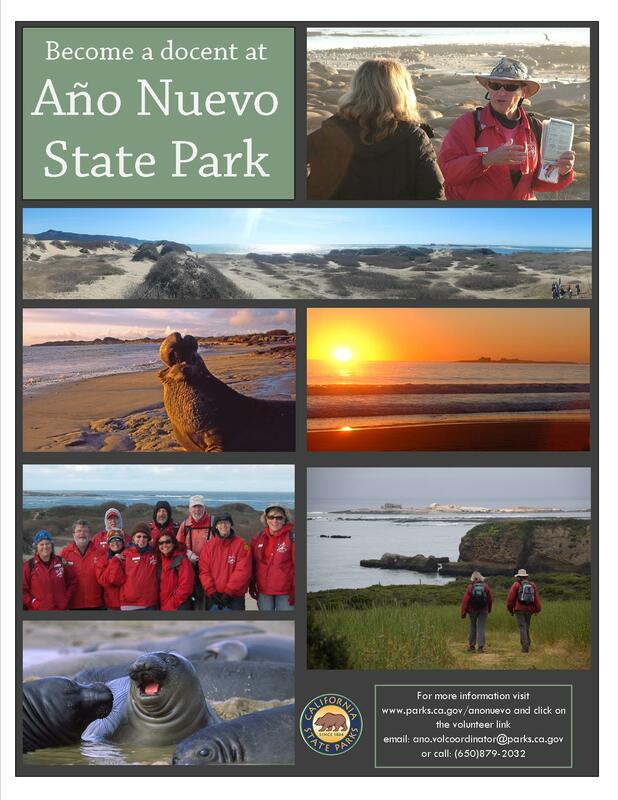 Año Nuevo State Park is seeking enthusiastic nature lovers and avid hikers to become docent naturalist volunteers. After attending a comprehensive training, volunteers become docents skilled in interpreting the natural and cultural history of Año Nuevo. 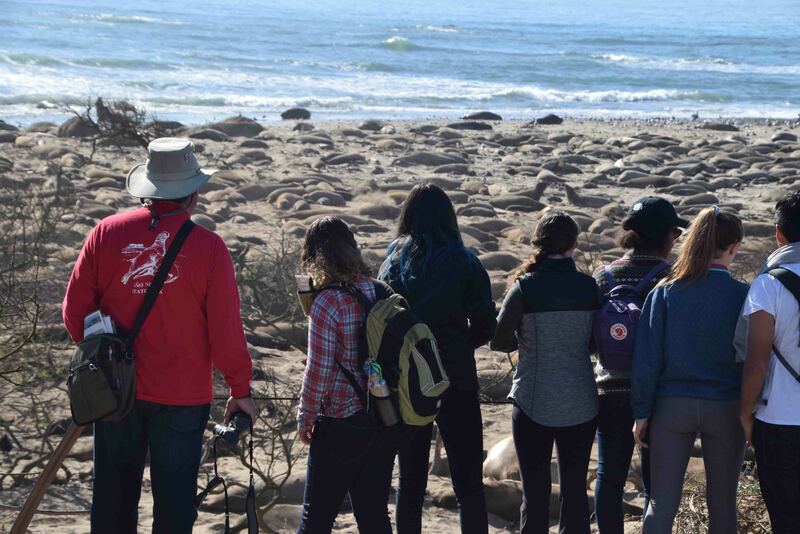 Docents lead guided walks during the elephant seal breeding season and are stationed at viewing areas in the spring, summer, and fall. Join our team and enjoy the many benefits of being a docent at Año Nuevo State Park. The following rules and regulations are for your own safety and to protect the plants and animals that live in this park. Elephant seal viewing requires a 3-4 mile moderate hike over varied terrain, including sand dunes. Driving to see them is not an option. Sturdy shoes, layered clothing, water and rain/wind/sun protection are recommended. Visitors requiring mobility assistance are encouraged to make a reservation for an Equal Access Tour. Visitor permits to see the seals inside the Natural Preserve are issued from 8:30 to 3:30. Visitors will not be able to obtain a permit after 3:30 due to the length of time it takes to hike to the viewing areas. Elephant seals are dangerous wild animals and are protected by the park. Harassment and disturbance of elephant seals is prohibited by state and federal laws. Seals can sometimes appear dead due to their quiet nature of sleeping on beaches. However, the majority of the time they are very much alive. Never get within 25 feet of an elephant seal. Due to the nearby Natural Preserve, pets are not allowed in the park and cannot be left inside parked vehicles in the parking lot. Bikes are prohibited on all trails in the park. Shells, rocks, wood, plants or animals. All features of this park are preserved and protected by law. Smoking is not permitted in buildings or on guided walks. Fires of all types are prohibited. Drone use is prohibited within Año Nuevo State Park. For information on obtaining these permits please contact the park directly. This park has generous support and funding from the Coastside State Parks Association and the Friends of Santa Cruz State Parks. 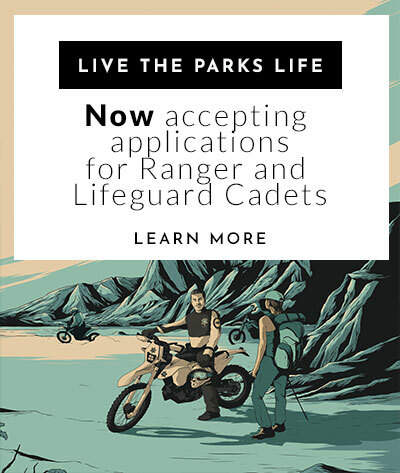 To learn more about how these organizations help California State Parks, visit Our Partners.